The decision has been made: you will exhibit at a trade fair (yay!). Exhibitions are incredibly useful marketing events. If done well, you can gain major contracts, find new clients and distributors and strengthen relations with existing partners and suppliers. Fairs are also great platforms to showcase new products, keep an eye on your competitors and expand your network. You can even find new employees to recruit! However, attending a trade show requires preparation (a lot!) and it can become overwhelming sometimes. 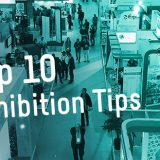 No worries, here are 10 Golden Tips to be successful when participating at exhibitions. Just follow these easy steps and you will become an expert in no time! stand design, promotional materials and giveaways, personnel attending, catering services, brand communications, etc. Appointing a stand manager will ensure that there will always be a person responsible to turn to if there are any questions or requests. This person will also become a bridge between your company and the fair organizers. The stand manager will create a schedule with deadlines to follow, guarantee that everything is on time and keep the management updated. Simply put: will help you organize your participation and avoid the chaos of involving multiple people and departments. Organizing your participation at an exhibition requires preparation… and time! certain services and utilities need to be booked weeks (or months!) in advance. samples and promotional materials not arriving on time, getting a bad stand location, not having enough personnel to attend the stand, etc. Plan everything with time and avoid unexpected last-minute issues! What do you expect to achieve by attending to an exhibition? As mentioned before, trade fairs are very useful marketing events for various purposes. Make sure you have a benchmark to evaluate after the show. It can be anything: from getting new leads to closing deals, introducing a new product or increasing your brand awareness. business cards given, contact sheets filled or giveaways distributed. Create a spreadsheet with all your goals and update the document at the end of each trade fair day. There are usually thousands of visitors at an exhibition. It is quite likely that a few hundred of them will pass by your stand; and the stand next to yours; and the one next to it; etc. Fair days can be long and exhausting, not only for the companies exhibiting, but also for the visitors. If they don’t know you and you want to get their full attention, you need to be able to sell them your product, service or proposition quickly. Prepare a unique 60-second pitch and train your personnel on how to bring it. If you can convince visitors with your proposition and they agree to have a sit down at your stand, you are one step closer to get a potential new business contact. 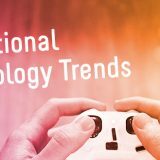 A unique pitch is a good start, but it is not enough. You need to train your personnel to become great salespeople: enthusiastic, good stand personnel determine the success of the trade fair. You can have the best product in the entire exhibition, but if your salespeople cannot convince your visitors, you won’t close many deals. Knowing your company and its proposition is essential to land new deals. On top of this, a good and positive attitude is a must! Bonus tip! If you are exhibiting at an international trade show, make sure to bring people that speak the local language. If none of your employees are fluent in the language, hire translators to help you during your meetings at the stand. Make sure that something is happening at your stand: create a buzz! For instance: employ a barista, rent a candy machine, organise gamification, lectures, demonstrations, entertainment, or give something away for free. If you need inspiration, check out our top recommended giveaways for exhibitions! If your budget allows it, build a breath-taking stand and offer food, drinks and entertainment. Exhibitions are an investment: it’s up to you to decide how much money you want to invest and how much you expect in return. Just remember that everything you do needs to have added value and suit your brand’s proposition! 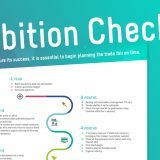 Once the exhibition has finished, a good evaluation is essential for improving your fairs participation in the future and determining whether the next edition is worth attending or not. Previously, we pointed out the importance of setting up KPIs before your participation. Now it’s time to evaluate them. Amount of new contacts you have made? How many existing clients, partners and suppliers have visited your stand? Did you close any deals or sales? Discuss your KPIs, but also your gut feelings and individual feedback. Reaching your target group only at the trade fair does not guarantee success. Exhibitions are a good first touch point, but the hardest work starts afterwards! prepare business proposals, schedule further meetings, invite them to your office or manufacturing facility, etc. Bonus tip! If you have attended an international trade fair, it’s important to understand the local business culture. In some countries, people might prefer a face-to-face meeting or a phone call to an email. Don’t just send an email and sit back: keep insisting until you get a reply! We said it before: exhibitions can be long, exhausting and require a lot of preparation. It is possible that many of your colleagues had to work beyond their working hours – and maybe even during the weekend, as well. Make sure to thank them for their efforts: a day off or a company lunch would be nice gestures of appreciation. Team bonding is definitely a nice side effect of participating in a trade fair! Take this opportunity to also thank your visitors for stopping by your stand. Before getting down to business, tell them how much you appreciate them taking the time to pay you a visit. You can even surprise them with a business gift – they probably met with many other exhibitors at the fair, so you need to stand out from your competitors (and business gifts are a great way to go). Check out our Top 10 original business gifts blog post if you need some fresh ideas. Take nice pictures and videos of your trade show participation and share them on your social media channels and company blog. – excluding those contacts who actually visited you at the fair, of course. Apart from being a good branding exercise, it may also help you to wake up the interest of some old customers and partners. They will regret not having visited you at the exhibition – and will be looking forward to getting back in business with you! 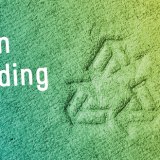 Did you enjoy our 10 Golden Tips to Participate at Trade Fairs? If that is the case, you can subscribe to our newsletter below and make sure that you don’t miss any of our articles. You’ll find very interesting tips on how to promote your brand! You’ll also receive our latest deals and promotions with great discounts to help your company stand out with business gifts and promotional products. 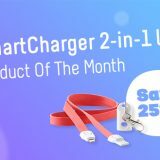 Previous Using printed lanyards to charge your phone? Now it’s possible!